Using a high-quality balsamic vinegar, pour into a medium size saucepan or small skillet with the cranberry juice. Place on medium-high heat and bring to a boil. Simmer and lower heat if necessary. Reduce until it's a little thinner than you want it—it'll keep reducing when you take it off the heat. Trim the asparagus ends, bring a large pot of salted water to a boil. Add the asparagus and cook for 3-5 minutes; until al dente. Cool at once in a bowl filled with ice water. 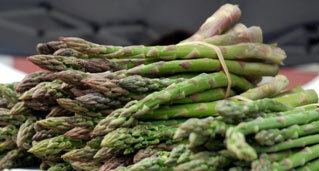 Toss asparagus with garlic, olive oil, seasonings and fresh thyme leaves. Place on medium-high heat grill and char on both sides for about 1-2 minutes per. Arrange asparagus on a plate and drizzle with balsamic reduction.